Takes seconds to use! This new VCAMO Spy Terminator/Killer utility will block & keep all spyware/adware off of your computer! 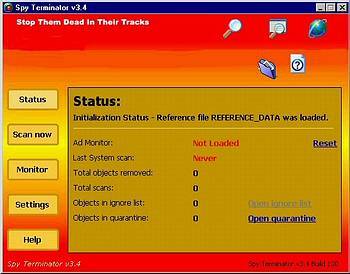 It also removes trojans & it can even detect viruses! If you have downloaded the supposedly free spy killers on the internet, you were probably disappointed to find that although they may scan your computer & find the spys...you must then purchase an unlock key in order to get rid of them! VCAMO Spy Terminator is not available for free on the internet & there are no keys to buy! You pay one price & use it for life! Spyware & Adware are hidden files that are on your computer that you don't even know are there! They are installed without your knowledge & allow companies to invade your privacy! Whenever you download anything (especially freeware) from the internet, the programs can contain components/code that allow these developers to collect information about YOU & anyone who uses your computer! Whether you know it or not, there are thousands of spyware/adware programs on the web! Without your knowledge - they track your internet habits as well as everything you do on your computer & can even alter your files! Spyware/Adware even hogs your system resources which slows down & causes problems with your computer. They can even present you with targeted popup advertisements! The implications from spyware/adware put your privacy & security at stake! When using active monitoring, this software will notify you whenever the program or software you are running contains spyware/adware code. Prevent privacy invasions before they even occur! Our software is already updated! VCAMO Spy Terminator finds & removes all spyware/adware programs hidden on your computer before they can do damage to your personal security & privacy! This program stays hidden & tracks what other people do on your computer. You can use a shortcut key to unhide the program. All you have to do is login & check what they have been doing! Find out what sites your children are visiting & print out reports!